Undoubtedly, Narendra Modi is the most popular prime minister that India has seen since independence. His popularity ratings in the media and internet hover around 74%. What is remarkable is that the loss of Delhi and Bihar state assembly elections has not dented his image as a highly capable and honest man. 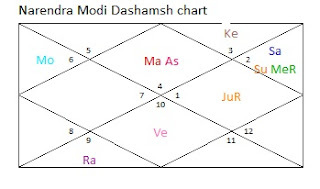 To ascertain how 2016 will treat Narendra Modi we shall examine his birth chart and the oath taking ceremony charts. Let us take the birth chart first. A majority of competent astrologers take his birth details as 17/09/1950 at 11.00 in Mehsana Gujarat. The following chart results from this data. The year is taken to be of 360 days as enjoined by Maharishi Parashar. Moon has a Shadbal of 100.09% and is fairly strong. She is how ever placed in her Neech Rashi Scorpio and is also weak in Pakshbal. Moon gets the Neechbhang as she is in a Kendra with her depositor. The problem of low Pakshbal remains. The ratio of the desirable/undesirable results for Moon is 12.34/47.66. Vimshopak Bal for Moon is 13. Moon is also the ninth lord placed in Lagna and as such suggests that the individual will be a self-made and become successful through his own efforts. 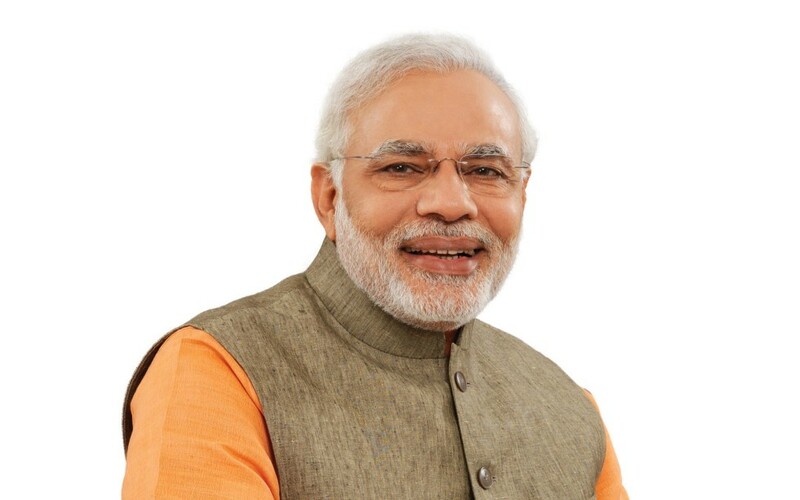 Since the ninth lord combines with the Lagna lord in Lagna, Mr. Modi has been fortunate with power, riches and happiness. Saturn becomes the fourth lord and is nicely placed in the tenth house with seventh lord Venus. Retrograde Jupiter aspects both Venus and Saturn. The depositor of Saturn – Sun is placed in the eleventh house with exalted eleventh lord Mercury. Saturn is strong with Shad Bal of 130%. His ratio of the desirable/undesirable results is 22.11/37.89. His Vimshopak Bal is 10. As the fourth lord placed in tenth house Saturn denotes political success. This placement of Saturn destroys enemies and makes him famous. The Antardasha of Saturn ends on 11/10/2016. In the Panchdha Grah Maitri chart, Saturn is friendly to Moon and Moon is neutral towards Saturn. This means that the results will not be unfavorable. Rahu aspects the tenth lord Sun and eleventh lord Mercury from fifth house. Every time a Bhukti of Rahu or Sun operates there will be a determined effort by the opposition to undermine his authority. The aspect of strong and beneficial Jupiter however will not allow a major headache. The placement of fourth lord representing the masses in the tenth house ensures that the people in India will keep supporting him in elections. Mercury is powerful and extremely beneficial. In the Dashamsh chart The Lagna lord is placed in Lagna itself. Even though Mars is placed in his Neech sign Cancer he remains a Yog Karak for this Lagna according to Parashar. The tenth lord in the Dashamsh Kundli is Mars and placed strongly in Lagna in Janma chart. This shows success through dedication and a strong desire to follow the right path. This also shows a steady and smooth success. The presence of the fourth lord Venus governing common man, comfort and happiness in one’s work is placed in the seventh house of associates and public relations. Modi’s popularity amongst masses will remain high. Moon-Saturn and Moon-Mercury Dashas will prove to be very beneficial. Despite all the smoke and mirror effects generated by the combined opposition, and their determined efforts to stall the forward march of Narendra Modi, he will remain unconquered. The apple cart may wobble a bit but will not be upset. The third lord Saturn in the tenth house indicates brilliant use of the media to take the wind out of the sails of the combined opposition. Assembly elections in UP in 2017 fall in Moon-Mercury period in Narendra Modis chart. Let us take a close look at Mercury as well. Mercury is 100% strong in Shadbal and ratio of his Isht and Kasht Phal is 57.37/2.63. Mercury is thus an unalloyed benefic in his chart. Vimshopak Bal of Mercury is 18 in his chart. Mercury is exalted and conjunct with tenth lord Sun. It is certain that his results will be sparkling in terms of political dividends. BJP/NDA will be quite successful in grabbing enough seats to make their own government. BSP may be wiped out. SP will certainly see serious attrition of its power and cadre. The year 2016 is bad for the middle eastern Muslim countries. Widespread unrest and bloodshed is more than likely. This is a long drawn out struggle which may spill over into 2017 and beyond. At the end of it, Saudi Arab, Bahrain, Egypt and Qatar will be left without a viable economy and without a vestige of strength to influence the middle eastern politics. The sun is about to set on these countries.This is the content of a separate blog by itself and will be dealt at a later date. These developments will affect how the Indian voter votes in a big way. The intransigence of certain very vocal but otherwise ineffective Muslim leaders will be decimated. Summing up, 2016 will prove to be a year of consolidation for Narendra Modi. 2017 will be the year to expand on the foundation already buit up. The pace of his reforms may be hastened by the outcome of the bloodshedding and mayhem in Middle east. Decimation of Saudi power will usher a new era of peace in this hapless part of the world. 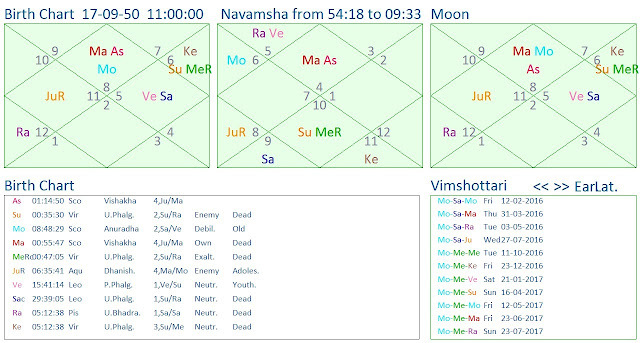 In the next Blog we will examine how the Oath taking ceremony horoscope impinges on the chart we have discussed above.